With the increasing demand for smartphones dipped in Gold, HTC has finally confirmed the much rumoured HTC One in Gold. The golden HTC One has been officially confirmed by Phil Blair, HTC President. The device has been dipped in 18 carat gold giving it a very premium look. The device would be presented at the MOBO Awards 2013, for the winner in the Best Newcomer category and as such has the laser-etched MOBO 18 logo on the back. 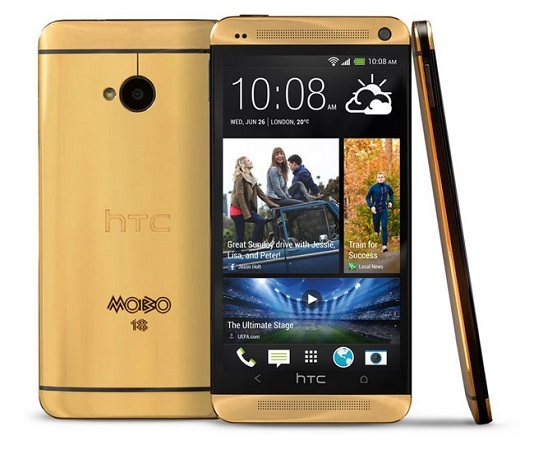 The golden coloured HTC One would be priced at $4400, which currently seems to be an exorbitant price for a smartphone. Even though the device seems to be very expensive, the phone would never be available for retail purchase as there are exactly five units of this phone. However the maker of this golden HTC One is offering to cover your HTC One in 24-carat gold for just $1600. Are you interested in a Golden colored HTC One?